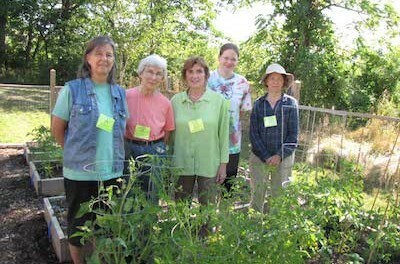 Volunteers maintain the community gardens at Project Self-Sufficiency. Image courtesy of Project Self-Sufficiency. Project Self-Sufficiency is seeking volunteers to assist with planting, maintenance and harvesting of fruits and vegetables from the six community gardens at the agency’s Newton campus. Volunteers would work alongside seasoned horticultural professionals on Mondays, Tuesdays and Thursday mornings, from 9:00 – 11:00 a.m. Wednesday evening hours from 5:30 – 7:00 p.m. are also available. Volunteers must be at least 17 years of age. No experience is required. Project Self-Sufficiency’s Newton campus is home to six vegetable gardens which bear all kinds of crops for consumption by the agency’s low-income participants. During the summer, hundreds of potted tomato plants also wreath the sidewalks throughout the 5-acre campus. Produce will be harvested daily and offered to agency participants as they enter the lobby at Project Self-Sufficiency. Baskets will also be provided for families to cart the bounty home and share with their children. Participants are given tips on cooking and nutrition along with the food, and the children at the agency’s Little Sprouts Early Learning Center help with the harvest while learning about healthy eating habits. 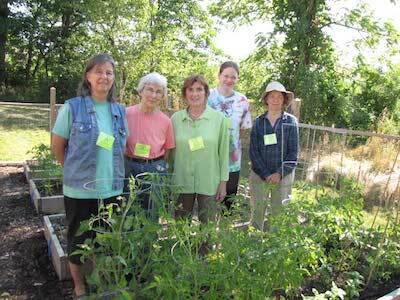 The agency’s original vegetable garden was initiated in 2011 by longtime benefactor Frances Gould Naftal. A swarm of community volunteers installed five more gardens on the campus last spring. A group of Master Gardeners from the Rutgers Master Gardening program maintained all six of the beds over the previous year. Project Self-Sufficiency is a private non-profit community-based organization dedicated to improving the lives of low-income families residing in northwestern New Jersey. The agency’s mission is to provide a broad spectrum of holistic, respectful, and comprehensive services enabling low-income single parents, teen parents, two-parent families, and displaced homemakers to improve their lives and the lives of their children through the achievement of personal and economic self-sufficiency and family stability. Since 1986 Project Self-Sufficiency has served more than 20,000 families, including over 30,000 children. To volunteer to work in Project Self-Sufficiency’s community gardens, or to find out more information about the programs and services available at Project Self-Sufficiency, visit the agency’s website: www.projectselfsufficiency.org or call the agency at 973-940-3500.